Anyone living in the Midwest can attest to the fact that the Winter of 2010 has been early, cold and snowy. These weather conditions can mean disaster in the form of massive fish die-off in shallow marsh lakes. Fish die-off is the result of reduced oxygen levels in the lake. J.C. Murphy Lake at Willow Slough Fish and Wildlife Area is standing on the verge of a winter die-off at this time. Those who know J.C. Murphy Lake are expecting a fish die-off to rival any in recent memory. The way things look, the only hope is a January heat wave. What causes the oxygen to be reduced to a level that is to low to support the fish population of a shallow lake? The amount of dissolved oxygen in the water is affected by the extreme weather conditions. Thick ice stops the transfer of oxygen to the water and a heavy snow cover causes the rapid dieing of oxygen producing aquatic plants because of the lack of sunlight. Decaying plant matter consumes high amounts of oxygen, resulting in oxygen levels that are to low to sustain the fish in the lake. So much for the bad news, now here's the good news! The lake at the Slough has 6-8 inches of ice and the fish are biting. 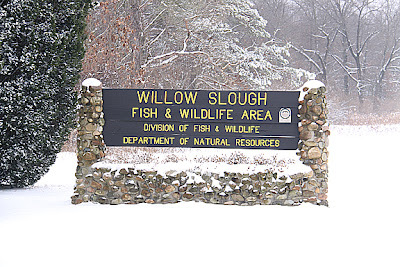 The restricted creel limit for fish caught at the Slough has been relaxed to the state daily limits because of the current lake conditions. 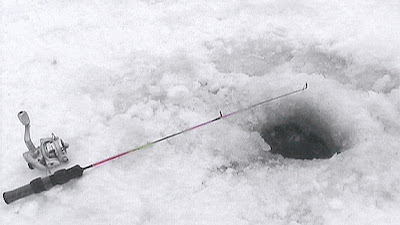 The state limits can be found in the Indiana State Fishing Regulations. 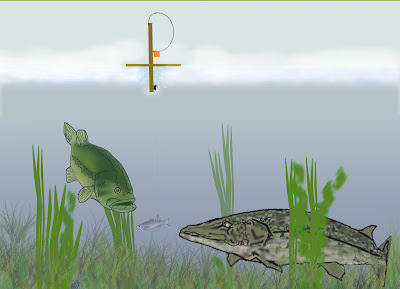 The bluegill, largemouth bass and northern pike bite is on now. Fish are being caught throughout the lake. Some days the bite is all day but most everyday a nice mess of gills can be caught during the last couple hours of daylight. The bluegills are taking beemoth and spikeworms (maggots). Find the bottom and fish about six inches above it. Place your bait on a ice fishing jig and watch for slightest movement of the float or rod tip if you prefer to tight-line fish. Currently there is no-limit on bluegill and the DNR would like for you to keep all the bluegill that you catch. 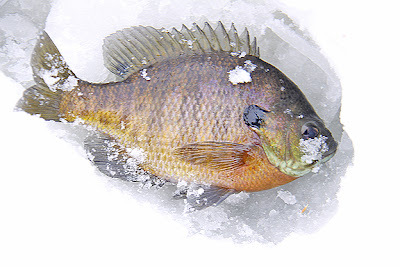 The bluegill are averaging six to eight inches, so you don't have to catch many for a nice mess of gills. The bass and pike are taking golden roaches (a large minnow), fished under a tip-up. Five bass that must be longer than 14 inches is the limit. Reports of twenty bass being caught and released are not uncommon. 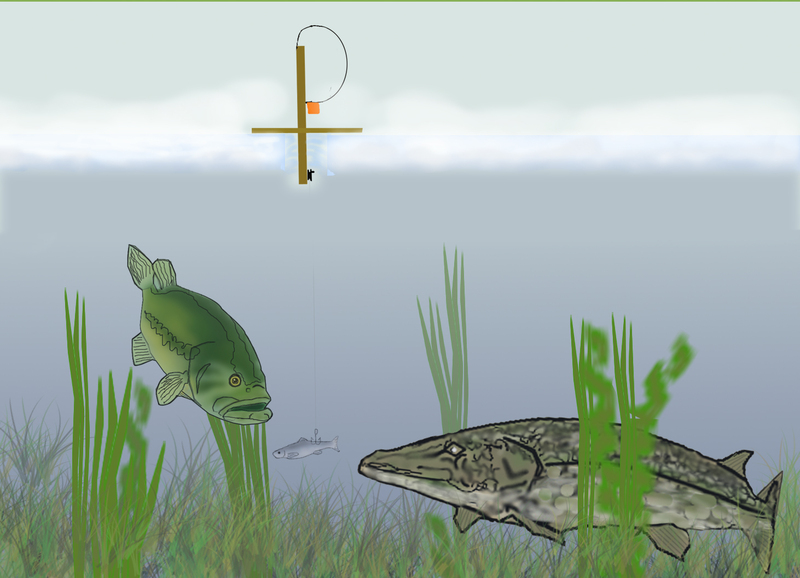 A keeper northern pike is longer than twenty inches and three pike is the limit. Not as common as the bass but pike of thirty-eight inches and fifteen pounders are being caught. 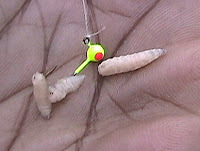 The pike are taking roaches but a three to four inch bluegill as bait would probably turn on a monster northern. Now is the time to "Ice Fish the Slough!" See you there.